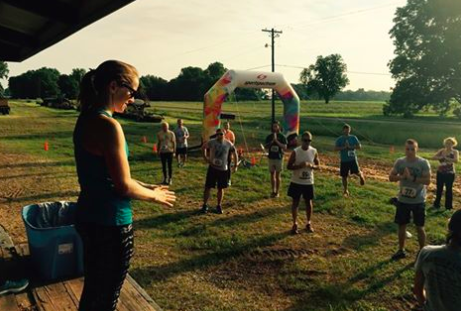 3rd Annual Backroads & Bayous Trail Run - One in a Series with Sports Spectrum! March 25th the 3rd annual Backroads and Bayous Trail Run and Day in the Country was held. Runners ran 10m and 3m distances through scenic farm country. A 1m fun run art and food made it a perfect event for the whole family! This event is a runners dream, but non-runners had plenty to keep them occupied! Title sponsor Breathe Yoga led yoga before and after the run. Our friends at Mahaffey Farm provided meat for insanely delicious tacos prepared by El Cabo Verde (home of award winning Chef Gabrielle Balderas). Beer was provided by local Red River Brewing Company! This year our run was one in a series of 3 trail runs with Sports Spectrum. Special awards were given for those running all three events. Read more about it here! The event benefits the Renzi Center and One Great River. Sign-up. Get after it! On May 9th 2015 Soprano Maureen Broy Papovich with husband, Casey and pianist Jeanne Sasaki appeared in Bryan College Station for a special musical performance. ﻿All donations were for the benefit of the RLCF. The concert featured a diverse program including poetry from Langston Hughes and Emily Dickinson and the Miribai Songs set to music. Also joining her was her son, Jonah who sang U2's tribute to Martin Luther King from their Joshua Tree album. December 3rd 2014, Pop up Studio Sale was held at Lockhorn Cider House, 21 South Wallace Avenue, Bozeman, Montana with works by Genevieve Ryder (seamstress extraordinaire) and Esther Sullivan (small metal works). Cider was shared, friends hung out and art was purchased with 10% of the sales donated to the Ross Lynn Foundation. October 30th- The first bale of cotton picked in the 2014 crop year by Newt Lynn of Lynn Farms was auctioned at the Louisiana State Fair. All proceeds of the auction of the bale will go to support the work and mission of the Ross Lynn Foundation. Those attending the first annual Backroads & Bayous Trail Run and Day in the Country were treated to a great course, amazing pulled pork tacos and live music. Yoga, acupuncture and art were enjoyed by all. It was a beautiful day with funds being raised for chosen charities One Great River and Renzi Center for Education and Art. Plans are already underway for next year! Best coffee to cross your lips! Have you heard about the best coffee to cross your lips? "Friend of the Foundation", Jeff Hollenbaugh has branded a blend that was one of Ross' favorites. Bonfire Coffee is selling this blend online with their other great roasts. This special blend is called BackRoads and Bayous and the profits of these sells go to the Foundation as part of our "Friends of the Foundation" giving. You can order the coffee on line at Bonfire Coffee.